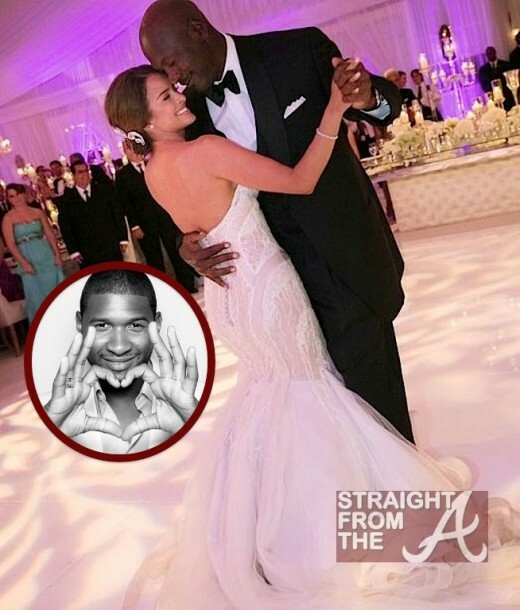 NBA legend Michael Jordan dances in the above photo with his lovely new bride, Yvette Prieto. Prieto wore a French silk voile corseted sheer sheath gown by J’Aton Couture, in an ecru palette with accents of flesh tones, with handmade silk lace created especially for her, and enhanced with Swarovski crystals. The pair peered romantically into each other’s eyes as they were serenaded by non other than superstar crooner Usher Raymond. 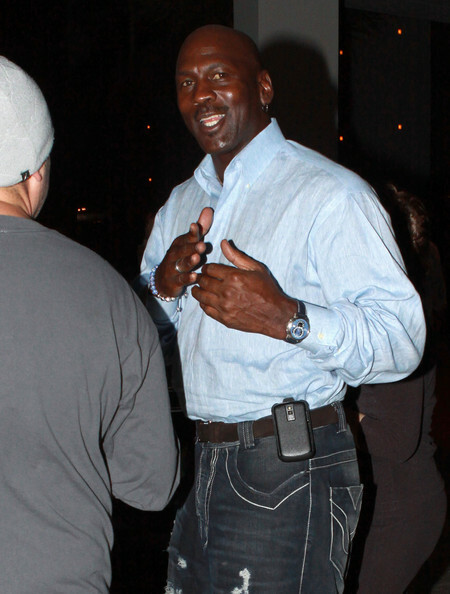 Jordan reportedly cut a huge pay check for Raymond to perform at the sport star’s lavish reception after he tied the knot with his model girlfriend of five years in Palm Beach, Florida on Saturday (April 27, 2013). MJ brought in Robin Thicke to serenade Prieto. Returning the favor, the bride surprised her legendary NBA superstar hubby with a set by none other than Usher. While Usher worked the stage, he wasn’t the only superstar in the room during the star-studded West Palm Beach wedding. Attendees included: Michael’s mom, Deloris Peeples, daughter Jasmine Jordan; his ex-Bulls teammate Scottie Pippen; director Spike Lee; Ahmad Rashad; Tiger Woods, Patrick Ewing and more. 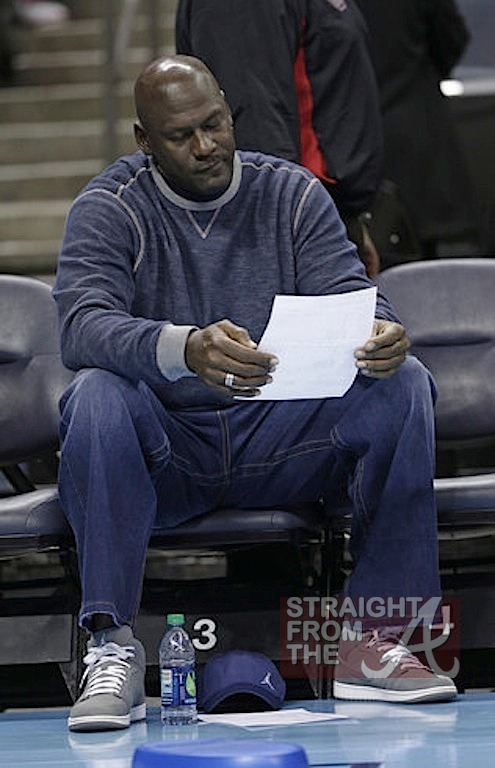 Basketball legend Michael Jordan recently turned 50 years old and is preparing to marry his fiance’ Yvette Prieto on April 27th of this year but will his “secret son” be involved in the festivities? 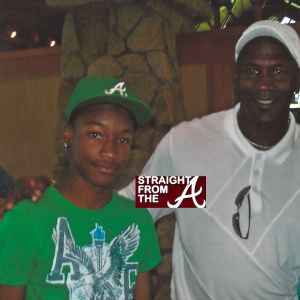 It’s been rumored for quite some time now that Jordan has a “secret love child” that lives in the Atlanta area and over the Christmas holidays the net was buzzing after the a 16 year old who goes by the name of Taj Jordan posted a youtube video claiming that Jordan was his dad. 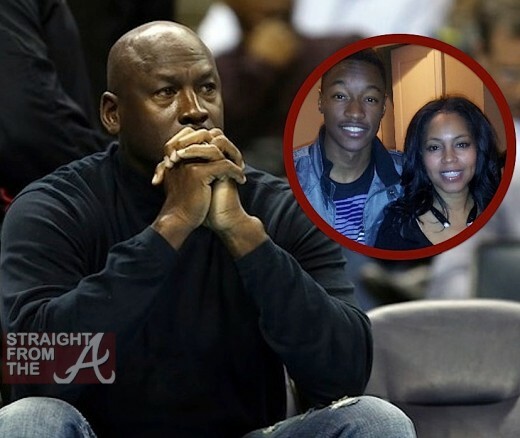 In the video, Taj claims that his mom, relationship expert Pamela Evette Smith, had an affair with Jordan back in the day and that she’d kept it a secret that Jordan was his father. Smith has remained tight-lipped on the matter, neither confirming or denying it’s validity… until now! 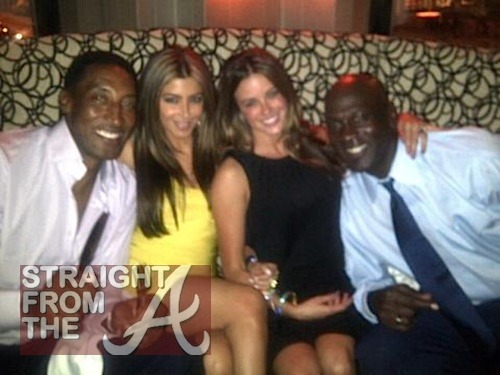 A few weeks ago, NBA great Michael Jordan and his girlfriend Yvette Prieto were spotted popping bottles with Scottie Pipppin and his wife Larsa during the opening of Michael’s new steakhouse in Chicago. The couples may have been popping bottles to celebrate Michael “popping” the question to his boo. Legendary NBA baller Michael Jordan owns a 2007 Mercedes McLaren SLR 722 but that’s not surprising in the least. What IS surprising is that he’s placed the expensive vehicle on eBay after only driving it a total of 932 miles! The McLaren can be yours for only $430,000 (it costs around $475,000 new). The sellers are clearly factoring in the whole “Michael Jordan owned this car” thing to up the value but hey… I’d buy it for that reason (if I hit the lottery!). Considering the fact that Birdman dropped $2.1 MILLION on a vehicle a few days ago, $430,000 seems like a deal to me.